Mt.Meakandake (雌阿寒岳) is an active volcano that is located in Akan National Park in Hokkaido, Japan. Mt.Meakandake is the tallest mountain in the Akan Volcanic Group. Mt.Meakan has two craters called Akanuma and Aonuma at its summit. Mt.Meakandake is the female, Mt.Oakandake（雄阿寒岳）is the partner. In the Ainu(native people) language Mt.Kengamine（1328m,剣ヶ峰） is known as "Machinesiri". 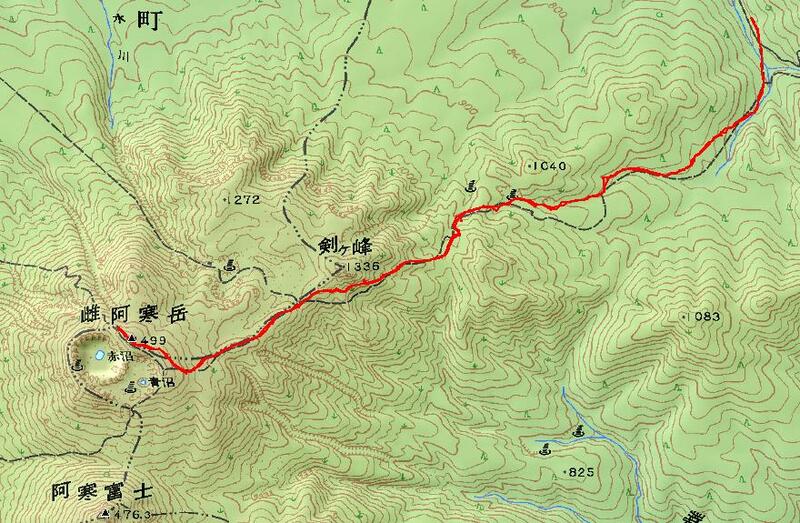 You can not climb to Mt.Kengamine like a knife edge, because there is no trail. Between Mt.Kengamine[machineshiri] and Mt.Meakan[ponmachineshiri], there is "Nakamachineshiri crater". Water accumulated in the crater, so looks red, it is called Akanuma（赤沼）. Over the Nakamachinesiri crater, Lake Akan, Mt.Oakandake is desired.Smoke rising from the crater is fluttering in Mt.Kengamine. Water accumulated in the crater, so looks blue, it is called Aonuma（青沼）. From the top of Mt.Akanfuji, Mt.Meakan, Mt.Kengamine, Lake Akanko and Mt.Oakandake is desired. Lake Onnneto is lake which was created as a result of volcanic activity at Mt.Meakanndake.From the Lakeside of Lake Onneto, Mt.Meakandake, Mt.Akanfuji is desired.There is a boardwalk around Lake Onneto and the view place. From the observation deck of the lakeOnneto, you can see Mt.Akanfuji and Mt.Meakandake. If you go up to the view place of Lake Onneto, Mt.Meakandake, Mt.Akanfuji, Lake Onneto looks.